颜泽, 冯兴雷, 侯明才, 付修根, 陈文彬, 谭志远. 羌塘盆地现代泥火山的发现及其油气地质意义[J]. 地质通报, 2018, 37(6): 1150-1156. Yan Z, Feng X L, Hou M C, Fu X G, Chen W B, Tan Z Y. First discovery of modern mud volcanoes in Qiangtang Basin and its petroleum geological significance[J]. 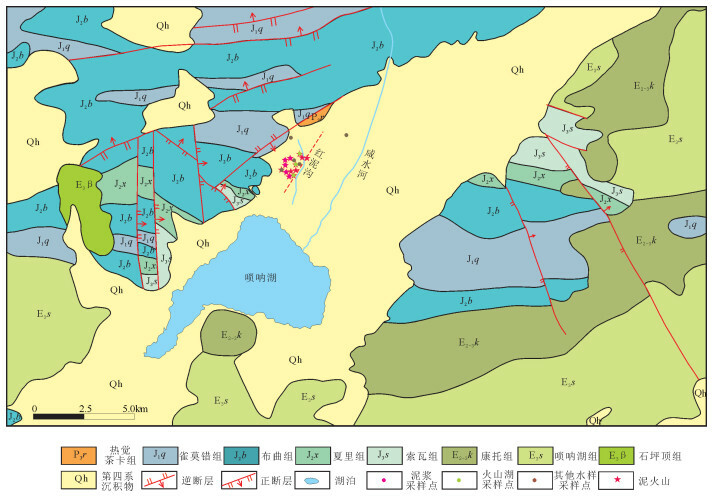 Geological Bulletin of China, 2018, 37(6): 1150-1156. Abstract: For the first time the modern mud volcanoes were found in Suonahu area of Qiangtang Basin. 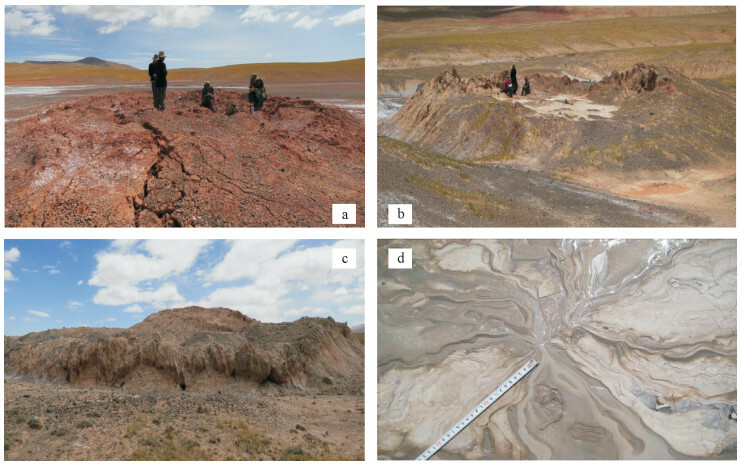 Through collecting water samples and mud samples and analyzing water chemical ions, water soluble hydrocarbon gas, and carbon and oxygen stable isotope, this paper discusses oil and gas geological significance of modern mud volcanoes. Hydrochemical types and hydrogen and oxygen iso-topes indicate that underground reservoirs may exist in this area. 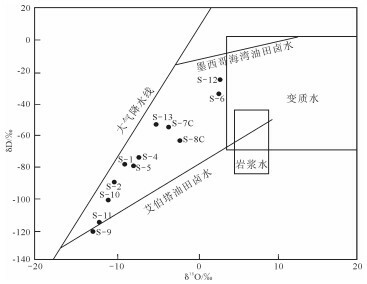 The test results of water-soluble hydrocarbon gas show that the gas composition is C1~C5, mainly methane, consistent with the gas composition of the conventional gas reservoir, and the carbon iso-tope discrimination result shows that it is oil gas of pyrolysis origin. Combined with geological background of the mud volcano, it is shown that mud volcano is the product of oil and gas reservoir seepage and leakage, and hence good prospects for oil and gas explora-tion lie in well preserved and non leaking areas. 李锰, 王道, 李茂伟, 等. 新疆独山子泥火山喷发特征的研究[J]. 内陆地震, 1996, 10(4): 359–362. Aliyev A A, Guliyev I S, Belov I S. Catalogue of recorded eruptions of mud volcanoes of Azerbaijan[M]. Baku: Nafta Press, 2002. Milkov A V. Worldwide distribution of submarine mud volcanoes and associated gas hydrates[J]. Marin. Geology, 2000, 167(12): 29–42. Dimitrov L I. Mud volcanoes:A significant source of atmospheric methane[J]. Geo. Marine Letters, 2003, 23(3/4): 155–161. Milkov A V. Global distribution of mud volcanoes and their significance in petroleum exploration as a source of methane in the atmo-sphere and hydrosphere and as a geohazard[C]//Mud Volcanoes, Geodynamics and Seismicity, 2005, 51: 29-34. 梁杰, 龚建明, 陈建文. 泥火山与天然气水合物[J]. 海洋地质动态, 2006, 22(12): 20–23. DOI:10.3969/j.issn.1009-2722.2006.12.006. 王道, 李茂伟, 李锰, 等. 新疆独山子泥火山喷发的初步研究[J]. 地震地质, 1997, 19(1): 14–16. 范卫平, 郑雷清, 龚建华, 等. 泥火山的形成及其与油气的关系[J]. 吐哈油气, 2007, 12(1): 43–47. 高小其, 王海涛, 高国英, 等. 霍尔果斯泥火山活动与新疆地区中强以上地震活动关系的初步研究[J]. 地震地质, 2008, 30(2): 464–474. 马小龙, 王芸, 杨红梅, 等. 新疆泥火山群细菌遗传多样性[J]. 生态学报, 2009, 29(7): 3722–3728. Sung Q C, Chang H C, Liu H C, et al. 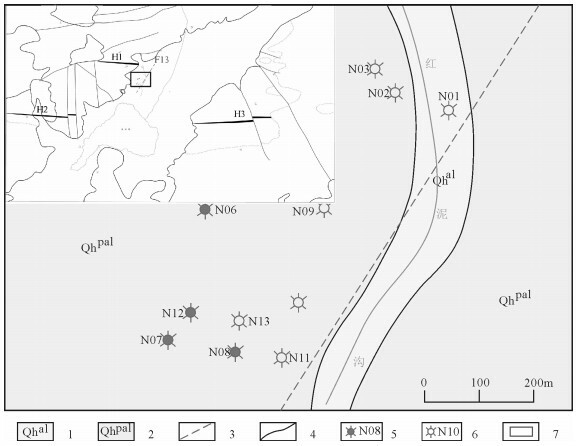 Mud volcanoes along the Chishan fault in southwestern Taiwan:Areleasebend model[J]. Geomorph, 2010, 118(1): 188–198. Sun C H, Chang S C, Kuo C L, et al. Origins of Taiwan's mud volcanoes:Evidence from geochemistry[J]. 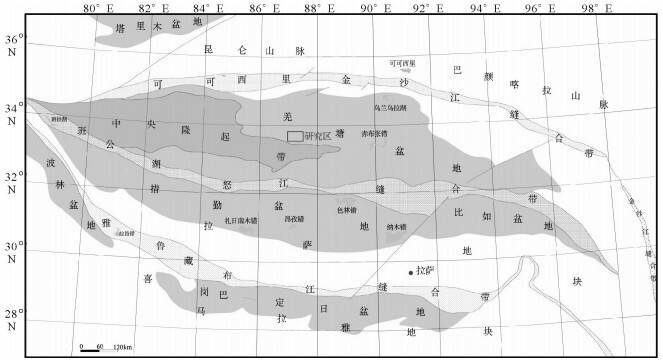 J. Asian Earth Sci, 2010, 37(2): 105–116. DOI:10.1016/j.jseaes.2009.02.007. Hung C C, Ch en F Y, Sun C H. Gases in Taiwan mud volcanoes:Chemicalcomposition, methane carbon isotopes, andgas fluxes[J]. Applied Geochem, 2010, 25(3): 428–436. DOI:10.1016/j.apgeochem.2009.12.009. 解超明, 李才, 李林庆, 等. 藏北羌塘中部首次发现泥火山[J]. 地质通报, 2009, 28(9): 1319–1324. 解超明, 李才, 吴彦旺, 等. 青藏高原羌塘中部泥火山喷发物中沥青脉饱和烃气相色谱特征及其油气地质意义[J]. 地质通报, 2012, 31(6): 977–978. 冯兴雷, 付修根, 谭富文, 等. 羌塘盆地戈木错地区泥火山群沉积及浅表地球化学特征[J]. 沉积与特提斯地质, 2015, 35(1): 50–56. 和源, 朱利东, 杨文光, 等. 西藏改则东地区第四纪泥火山的首次发现[J]. 地质科技情报, 2016, 35(4): 38–42. 戴金星. 各类烷烃气的鉴别[J]. 中国科学(B辑:化学·生命科学·地学), 1992(2): 185–193. 张义纲, 章康复, 郑朝阳. 识别天然气的碳同位素方法[C]//有机地球化学论文集. 北京: 地质出版社, 1987.